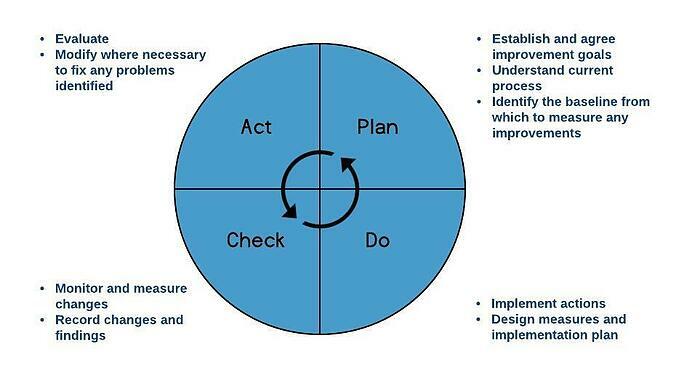 How do Universities Approach Process Improvement? The administration of universities and the way education is being provided has shifted in recent years to the adoption of business process improvement principles that were historically the domain of manufacturing companies and, more recently, the service industry. This focus has seen some noticeable changes to the delivery of education services such as viewing students as customers and a noticeable commitment to programmes that improve quality and efficiency. Universities were slow to adopt process improvement because it meant approaching the institution with a business mentality rather than through the lens of an education service provider. Today we know universities can be both an institution that cares about its students and an organisation making business decisions that improve efficiency and save money. 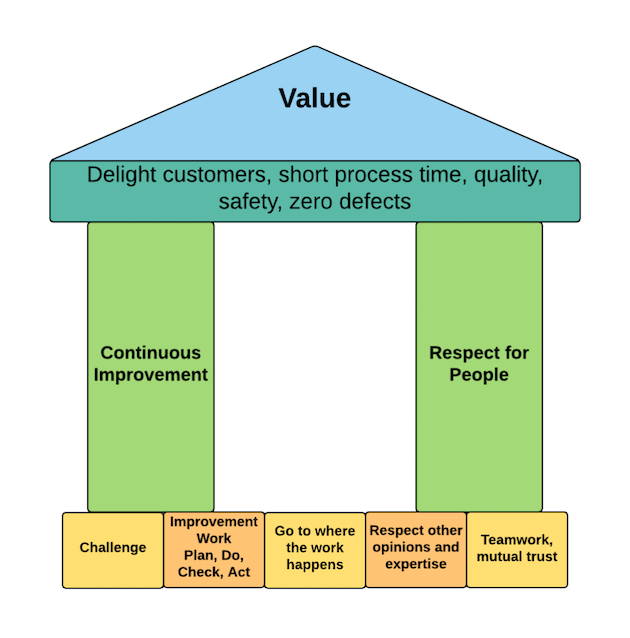 After all, the process approach to business improvement revolves around Deming's revolutionary 14 points, the focus being that increasing quality would help the company improve efficiency, improve the product and the way that product is created - which would in turn also improve the customer experience. In short, quality helps everybody. It's little wonder therefore, that many universities that I have spoken with have primarily used Lean solutions to improve their business processes - whether directly or indirectly. Because of this improvement shift in university culture, I decided to look at the improvement initiatives of a range of universities to see just how universities are tackling the process improvement problem. Bringing a business mindset into the higher education sector can be a rather complex endeavor. This is why it matters greatly to choose the right business process improvement methodology for each individual university. In 2016, the Universities and Colleges Information Systems Association (UCISA) published their best practice guide on university process improvement with the title 'Establishing Process Improvement Capabilty in an HE enviroment'. "the UK higher education sector is currently using a variety of approaches and methodologies to establish capability. The predominant sector approaches are Lean and six sigma, with the business process review (BPR) process in second place. It is clear that institutions are mainly taking a mixed model approach to improvement". How Have These 8 Universities Harnessed Continuous Improvement? The University of Aberdeen was founded in 1495 by William Elphinstone, Bishop of Aberdeen and Chancellor of Scotland, and is therefore Scotland's third oldest and the United Kingdom's fifth oldest university. "The function of the Business Improvement Team is to facilitate and catalyse, remove barriers, and help groups work better together, with the overall aim of improving the university for students, staff and other partners." Adding value to everything we do and removing unnecessary burdens. Continuously looking for ways to improve. Always remembering who the beneficiary is of the work. Employee-led improvements (bottom up, not top down). With more than 40 years of experience, the University of Deakin is one of Australia's best higher education institutions. Located in Melbourne, they are known "as a globally connected university, with five popular campuses [...] and technology-rich learning centres". Excellent universities require excellent business process management skills, which is why a Process and Performance team was set up at the University of Deakin. One of their predominant goals: to build and sustain BPM capability with a focus on people, process and necessary tools. According to Janet Green, Project Manager at the University of Deakin, they there was great demand for continuous improvement at Deakin: "We knew there was a huge appetite for process improvement at Deakin. We knew that Process Owners had a clear vision of ‘what’ they wanted to achieve." "The right people continuously searching for the simplest and smoothest process, in order to meet customer needs perfectly"
Founded in 1964, the University of Essex has moved towards a continuous improvement and change management mindset in order to improve their rankings as well as the overall student experience. The Strategic Projects Office (SPO) handle all continuous improvement projects at the University of Essex. This includes facilitating events as well as the thorough training, mentoring and supporting of staff, who are then encouraged to deliver their own change improvements. Achieving change and training staff to do the same is a well-organised and structured undertaking at the University of Essex: "the core CI Programme for the year is developed and approved through the Project Coordination Group (PCG) and centres around areas that will help to deliver the University's strategic aims". Formed in 1995, the aim of the University of Exeter is to "built on a strong partnership with its students and a clear focus on high performance". With that in mind, the University of Exeter focuses on a strong foundations of leadership, governance and management. With several successful continuous improvement projects already completed, one of their current projects is called 'Lean Rapid Improvement Events (RIE)'. The goal of Lean RIE is to introduce a "customer focused, efficiency based culture" through empowering staff. Lean RIE "gives front line staff new skills, empowers them to make decisions and gives them a new team based way of working". RIE is designed to achieve improvements within smaller operational units or areas. It is shorter than the other continuous improvement initiatives and the event itself usually lasts from one to five days. Other continuous improvement projects include the Lean Exeter strategic initiative, which lasts about six months and typically focuses on rendering complex processes more efficient. However, "both approaches use the same Lean tools and approaches in order to establish a new way of thinking and working for all those involved". "We are building a ‘Leicester approach’ to continuous improvement which uses a range of tools that we have learned work well in at Leicester, all underpinned by a generous helping of common sense." Rather than focusing on one single process improvement methodology, the Continuous Improvement Team prefers to remain flexible and work "in a number of different ways including facilitation of focused pieces of work, training and development, or providing a ‘guide on the side’". This flexible approach to continuous improvement has had several benefits: one of their past projects concerned process improvement within the HR Recruitment - with successful outcomes. The Continuous Improvement Team made sure that all HR staff mapped out their current As Is processes and also organised focus group meetings with hiring managers in order to identify their processes and process issues. In this case, the Continuous Improvement Team was able to unveil that hiring managers were interested in more control when hiring staff, and that the overall processes were to complex and could be simplified. In the end, the team "decided to make two changes: they introduced a recruitment plan which put all the recruitment information in one place to ensure clarity for the hiring manager, and they also ensured interview details were included on the shortlisting grid so that candidates could be invited more quickly". This decision has since significantly reduced business waste, especially the time spent responding to chases and queries. The changes also ensured more control for managers when hiring new staff. The University of Leicester serves as a good example that it is possible to adopt a flexible approach towards the different continuous improvement methodologies and still achieve very successful results. Miami University, founded in 1809, was named the most efficient U.S. national university by U.S.News in 2017. Despite the fact that Miami University is first and foremost an educational institution, the Director of Lean Initiatives Alfred Ryan and his team managed to achieve employee buy in and were able to successfully introduce their employees to Lean Business Management. We have over 3500 employees who have been introduced to Lean through training, participation in our Lean Fair, member of a Lean team and participating in our certification program (200 enrolled and 65 certified Lean Leaders). By means of a clear organisational structure of lean process improvement, they managed to get everyone on board and engage all university divisions in Lean Initiatives. Most importantly, the Miami University Lean Inititatives team practiced continual improvement for 9 years through 'evolution' and not 'revolution'. As a member of the Russell Group of Leading UK Research Universities, the University of Sheffield is rated 75th in the world based on excellent teaching and research. In order to get there, the University's Process Improvement Unit had to continuously work on achieving more effective and efficient University processes. This way, more of the resources "can be spent on learning, teaching and research". We have grown enrollment in the past several years and that growth has challenged many of our work processes. They simply needed to be looked at to determine where the waste was located in the processes so that we could become more efficient. The focus has been to improve the management of our workforce by vigorously training our managers and supervisors. However, we realized that having good people, even if they are fairly well-managed, working in bad processes is a recipe for failure. Put a good person in a bad system and I’ll bet on the system almost every time." 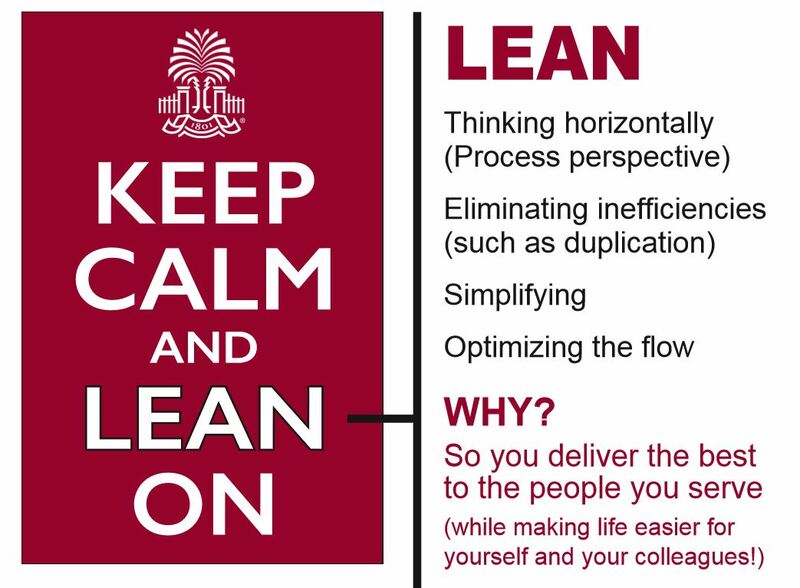 After spending five years trying to improve the work environment at the university of South Carolina, the Professional Improvement team took managed to implement lean process improvement successfully. Implementing a business mentality at institutions that are predominantly concerned with providing higher education can be particularly challenging. While the following examples confirm this theory, they will also teach us that it is not impossible. These following examples show that successful university process improvement depends on continuous employee engagement and staff-led initiatives. The University of Aberdeen's Business Improvement Team focuses specialises in employee-led improvement projects, and designed specific training sessions to increase employee engagement in continuous improvement. "The Business Improvement Team are facilitating lunchtime "taster" sessions designed to provide an overview of Lean methodology and a brief insight into the tools and techniques used by the Business Improvement Specialists." "Our two-day training course, recognised by the Institute of Leadership and Management as a Development Programme, is designed to provide in-depth training in Lean methodology as it applies to the Higher Education sector, to further knowledge and expertise of university staff." Provide teams with exactly the right training to suit their needs. Oriented towards the application of particular lean tools and techniques. From 2 hours to a series of sessions planned over a longer period." "I was worried beforehand that I would find the course challenging and jargon heavy - it was quite the opposite and I am very pleased I attended. A light bulb moment for me!" "Some great ideas to help reporting on my projects regarding visual reporting (A3 reports, burndown charts etc). I found the event, interesting, informative, engaging and challenging. The day was a good mix of activity (we weren't left staring at a screen being lectured at all day)! I'll endeavour to incorporate LEAN principles into my working practices. Particularly process flow mapping." In addition, the Change Team also developed staff training courses, including "Growing your practical project management skills" as well as "Managing others through change". This way, they can ensure that staff acquire valuable skills to stand on their own two feet regarding future continuous improvement and remain involved with current projects. In order to implement a business mentality in higher education, the University of Sheffield's Process Improvement Unit relies on a well-structured programme. Design/Redesign: a 3-5 day process improvement event is held and TO-BE processes are identified, followed by a list of actions that have to be carried out. In order to demonstrate the successful outcomes of their continuous improvement strategy, the University of Sheffield also published several case studies, which you can find here. "Being involved in a PIU project makes you think about your everyday processes and changes your way of thinking. Being involved gave me the motivation to make changes and I felt my enthusiasm was passed onto my colleagues." On the road to lean university process management many obstacles have to be overcome. One of the major problems encountered by the University of South Carolina was their lack of staff resources. Not many staff were trained to teach and facilitate lean improvement activities - meaning that the team had to start from scratch and learn everything themselves. The next obstacle was achieving employee buy-in. Convincing busy university staff that it is worth their time to commit some time to work through the Kaizen process was difficult, especially regarding the fact that some university departments were already understaffed. According to Nathan P. Strong, Director of Organizational and Professional Development at the University of South Carolina, "committing 4-5 days to a Lean project can be a hard sell". However, once staff had participated in the lean improvement seminars and workshops, they were able to see the efficiency and efficacy advantages of the lean university undertaking. One of the remaining challenges is concerned with getting people to think in terms of process improvement and enable them to select promising projects self-sufficiently. Working at an educational institution, "many people are 'in the weeds' and have a hard time thinking big picture and identifying the opportunities for improvement." However, this issue can be solved through follow-up training and regular team meetings regarding continuous improvement developments and projects. Even though the journey matters, the road of continuous improvement eventually has to lead to tangible results. These can include achieving ROI, cutting or transforming processes that waste time and money, turning a heavy paper-based system into a mobile solution, or streamlining and automating business processes. In order to show what Lean University Management can achieve, I have selected two of the most astonishing results. The thorough application of Lean principles rendered the University of Miami's processes more efficient than ever before. The success of Miami University did not go by unnoticed: the University was named the most efficient U.S. national university by U.S.News in 2017. Since the article was published, Alfred Ryan, the Director of Lean Initiatives at Miami Universities said that they have doubled their deliverables to $58 million and have completed over 1300 Lean Projects. According to the Nathan Strong, the Organizational and Professional Development team have had several well-documented Kaizen projects that were successful. While most of the continual improvement projects are published on their website, especially the most recent (not yet published) campaign reveals state-of-the-art lean university process management. 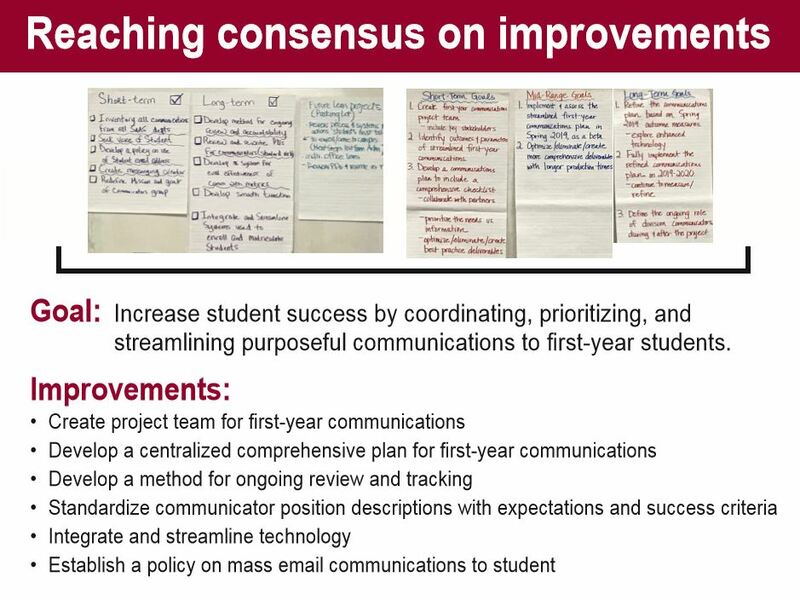 With the goal to cut business waste and and increase student success, Nathan Strong and his team set out todevelop a centralised, comprehensive plan for first-year communications with students. This way, the Organizational and Professional Development team will manage to streamline and standardise their student services - and thereby render them more accessible and user-friendly. Lynn joined Triaster in November 2017 as the new Inbound Marketing Executive. Prior to her work with Triaster, Lynn worked in content management and studied at the University of Oxford.